Six chocolate cupcakes – you can use shop-bought ones, or make your own. For ours, we used a recipe adapted from the Hummingbird Bakery Chocolate Cupcake Recipe. A packet of liquorice Catherine Wheels – we used Barratts. A packet of five cost less than a pound. Six chocolate teacakes – we used Tunnock’s dark chocolate teacakes, as they were a better match for our cupcakes. 12 coated chocolate beans (like Smarties) – we had green chocolate beans to coordinate with our colour scheme. A little chocolate buttercream, or chocolate fudge icing. Unroll your catherine wheel sweets, and cut 24 lengths of liquorice. Each approximately 20cm long. Arrange the lengths of liquorice on the top of your cupcakes, four on each cupcake. 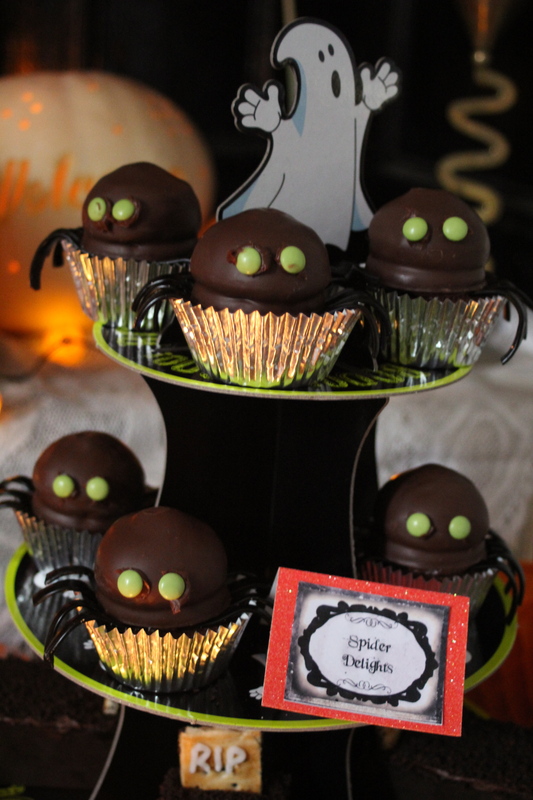 Make sure equal lengths of liquorice are hanging off each side, from the top of your cupcake – these are the spider’s legs. Take your teacakes, and a little of the icing, and either pipe, or use a knife, to make two dots of icing on one side of the teacake. Affix the two of the chocolate beans to the teacake, using the icing dots, to make your spider’s eyes. Spread a little of the icing on the bottom of the teacake and fix the teacakes to the top of your cupcakes. Make sure you place it in the middle with the liquorice legs hanging over the sides!